Heat oven to 425°F. Spray 15x10x1-inch pan with cooking spray. 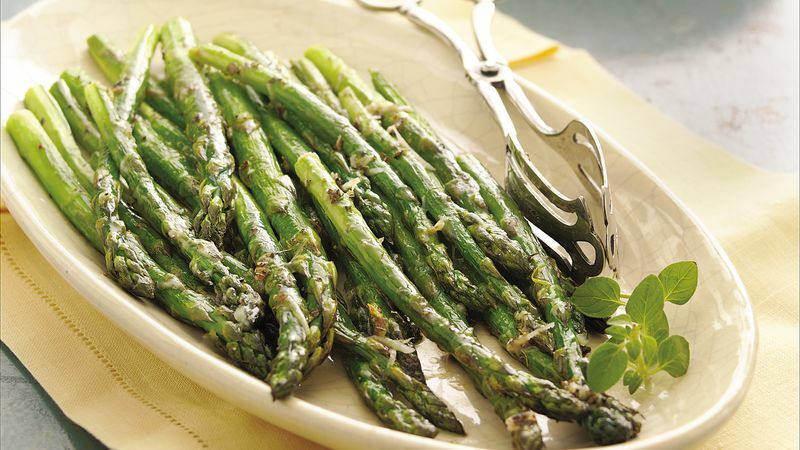 Wash asparagus; break off tough ends where stalks snap easily. If desired, peel stems of spears. In shallow bowl, mix remaining ingredients except cheese; toss with asparagus to coat. Spread in pan. Roast uncovered 10 minutes. Sprinkle with cheese; toss to coat. Roast uncovered 5 to 8 minutes longer or until asparagus is crisp-tender. Have the asparagus trimmed and ready to bake. Pop it in the oven while the roasted turkey is standing and you're making the gravy. Substitute 1/4 teaspoon each garlic powder and coarse ground pepper for the garlic pepper blend.